Cane EnAbled focuses on all things related to the white cane including safety, usage, personalization, perspectives from those in the field, and parents of B&VI children. When your cane and shoes match! It really was a happy coincidence since I recently had one of those ‘what in the heck am I gonna wear today?’ days. In the featured photo, we see my shoe-clad foot and matching gold cane (description is below). When I ordered my new customized ‘white canes’ I volleyed back and forth unsure of the colors I wanted. However, as I got ready for a meeting I knew the gold cane would work with my outfit choice. The problem was I hated my outfit. I walked around the house in said outfit until just before my paratransit arrived—then I did the unthinkable. I tore off my clothes, snatched a dress off the hanger, then pulled out these cute little flats I’d forgotten about. My ride came to collect me and when he dropped me at my destination he commented on how nice my shoes looked with my cane. I’m like, “oh, why thank you!” Since I have a style reputation to uphold, I wasn’t about to tell him I didn’t know they matched. But secretly I was so delighted. The other day I was in yet another ‘what cane should I use quandary?’ I was so tempted to use the black one because it is my favorite but reasoned that I needed contrast. Since my outfit was mainly black (with blush—muted pink—accents) I felt the gold cane would be a better choice. In image 1, I’m sitting on a bench at the mall wearing a black tee, very comfy lightweight black pants, blush colored light knit open sweater and blush fringed flat slides. My gold cane is in my right hand. For jewelry, I’m wearing a long silver toned fringed necklace and a sparkly bracelet which I’ll talk about in a separate post. Since I’ve always enjoyed expressing my personal style I decided to extend this logic to my cane as well. I wrote an article, Cane EnAbled—Puttin’ On The Glitz, a while back that talks a little more extensively on this topic. Aside from flexibility in customization, I also like the folding Ambutech Slim Line canes because they are so compact. They are very light and portable although they are not as sturdy as a standard mobility cane. In view of this, I like the idea of having several back-ups just in case one should bend or break. What are your thoughts on customizable mobility devices? 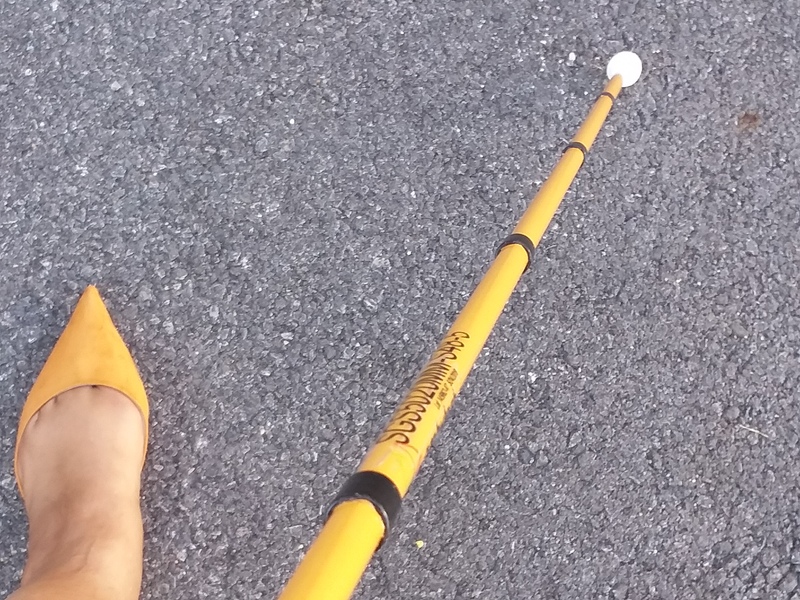 A photo of my two new (black and gold) Ambutech Slim Line canes next to my older mobility cane. All three canes have five sections. The older cane has a green grip, 3 white segments, and 1 gold segment near the tip. Happy White Cane Safety Day! White Cane Safety Day celebrates the achievements of blind and visually impaired (B&VI) people in the United States on October 15 every year. It also reminds people of how the white cane is an important tool in helping the B&VI live with greater independence. This year Bold Blind Beauty participated in White Cane Safety Day festivities in Pittsburgh, PA, and Milwaukee, WI. Pittsburgh celebrated its White Cane Safety Day on Friday the 13th. The celebration kicked-off with Jimmy Sapienza’s Five Guys Named Moe, a fabulous jazz combo comprised partly of musicians who are blind. We joined Blind & Vision Rehabilitation Services of Pittsburgh, Golden Triangle Council of the Blind, and the Bureau of Blindness and Vision Services to debut our White Cane Rules of the Road initiative. I was so grateful to hear people’s stories of loved ones living with blindness or sight loss. An added bonus was their excitement of Bold Blind Beauty’s message of changing the way we perceive one another. Steph McCoy stands in front of Bold Blind Beauty’s display at White Cane Safety Day celebration in Pittsburgh’s Market Square. A personal highlight of the event was when one of my good friends came by to help man our exhibit. She was ecstatic when she found out all of our materials were also in accessible formats. So ecstatic, she began reading her braille packet almost as soon as she sat down. Blind & Vision Rehabilitation Services of Pittsburgh table, banners and awareness materials. In Milwaukee, on October 17, Bold Blind Beauty joined Industries for the Blind (IB) to celebrate White Cane Safety Day. At our exhibit table, we shared our materials with more than 80 blind young people and their parents. In addition to White Cane Rules of the Road WI, we shared information on empowerment for B&VI women. 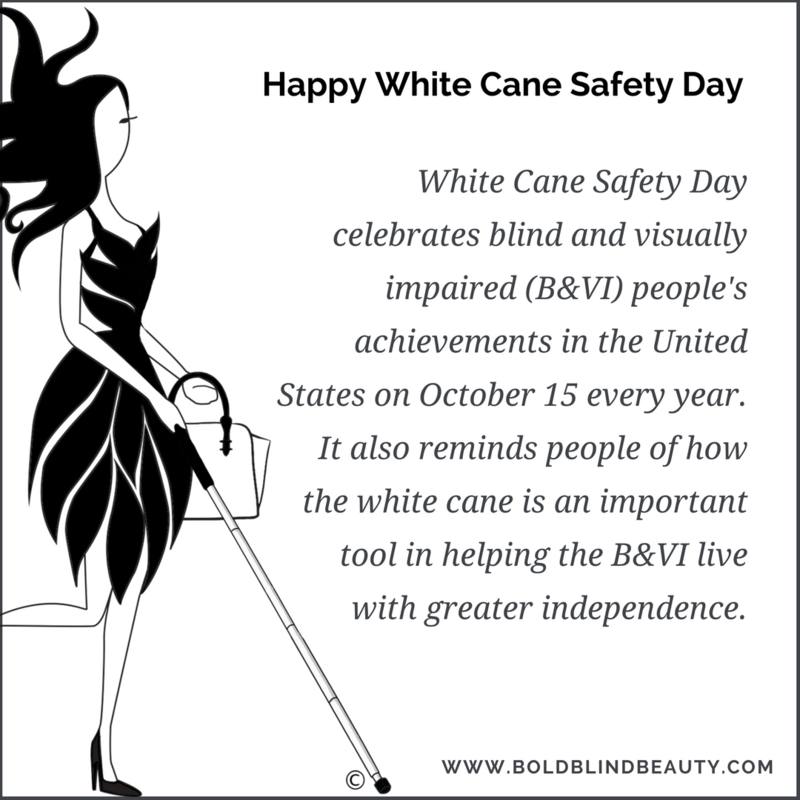 As White Cane Safety Day recognizes the contributions of B&VI people within our society, Bold Blind Beauty will continue its mission of changing the way we perceive one another. Empowering B&VI women as well as connecting sighted and nonsighted communities to end misconceptions about blindness is the path to our mission. Description: www.boldblindbeauty.com template with Abigale (Abby) to the left of the quote. The Abby icon is shown walking with her white cane in one hand and handbag in the other. The image is black and white and she wears a stylish black dress and black heels. Her signature hairstyle is best described as explosive. Today, Bold Blind Beauty is pleased to announce its “White Cane Rules of the Road” initiative. In partnership with the Pennsylvania Council of the Blind, the initiative conveys tips for both blind and visually impaired (B&VI) persons and sighted persons—particularly motorists—to help keep B&VI persons safe whenever they are using their white mobility cane to navigate. The White Cane Rules of the Road initiative kicks off with a card—printed in large type for low-vision persons, and in braille for blind persons—as part of an information packet about boldblindbeauty.com. It will début at White Cane Day celebrations in Pittsburgh Pennsylvania, and Milwaukee Wisconsin. The card provides tips on how to be safe when using a white cane, and inscribed on the back, are state statutes outlining the proper protocol for motorists when around B&VI cane users. The Bold Blind Beauty tables at each event will have Bold Blind Beauty braille-labeled wristbands, informational packets, and sample promotional items such as mugs and T-shirts from the website. White Cane Safety Day celebrates B&VI people’s achievements in the United States on October 15 every year. It also increases awareness of the white cane traffic safety laws. Following are details for the White Cane Safety Day celebrations in Pittsburgh and Milwaukee. If you happen to be in Pittsburgh or Milwaukee on the above dates please stop by the Bold Blind Beauty table to say hello, pick up your White Cane Rules of the Road, and a little swag. For more information about White Cane Rules of the Road visit us online at boldblindbeauty.com. What bothered me most about my sight loss was my fear of people knowing I couldn’t see. Everywhere I went I felt so vulnerable and isolated not to mention, my anxiety levels rocketed off into the stratosphere. Each step I took was a step closer to breaking my neck. So what was my solution as my sight kept deteriorating? I faked it of course. Adjusting to sight loss is a process and everyone who goes through it does so in a different way. I was so used to putting on my professional mask each day. It was important to me for people saw what I wanted them to see—a composed person. Yet after work, and sometimes throughout the day while hiding in a restroom stall, I was a blubbering mess. My life was unraveling. When I met with a Vocational Rehabilitation Counselor (VRC) to discuss the assistive technology I would need to keep my job, I was stunned when he mentioned the white cane. To determine my needs, I had to answer questions but I never thought the white cane would enter the discussion. For Pete’s sake, I mean I couldn’t see but I wasn’t blind. I had a lot to learn. “The only person you are fooling is yourself when you pretend you CAN see when you clearly CAN’T.” This comment from the VRC didn’t go over well with me. Even so, I grudgingly took Orientation and Mobility training to learn how to use the white cane. Once my lessons were over the cane went to my closet where it stayed for months. My eventual acceptance of the white cane came about as I began to accept my sight loss. Meeting and befriending blind people who strongly advocate for the rights of blind persons led me to volunteer for several blind organizations. Becoming a part of the blind community and refocusing my efforts on helping others was the most important piece that ultimately gave me a sense of peace. I still have days where I don’t feel as secure as I’d like, we all do, but when I come back to my ‘why,’ I can recharge, readjust, and refocus to stoke the fire of my passion. Improving humanity by changing the way we perceive one another is my mission and to achieve it I must continue moving forward and doing so with my white cane. I’ve found that being Bold Blind and Beautiful comes from living life to the best of my ability. 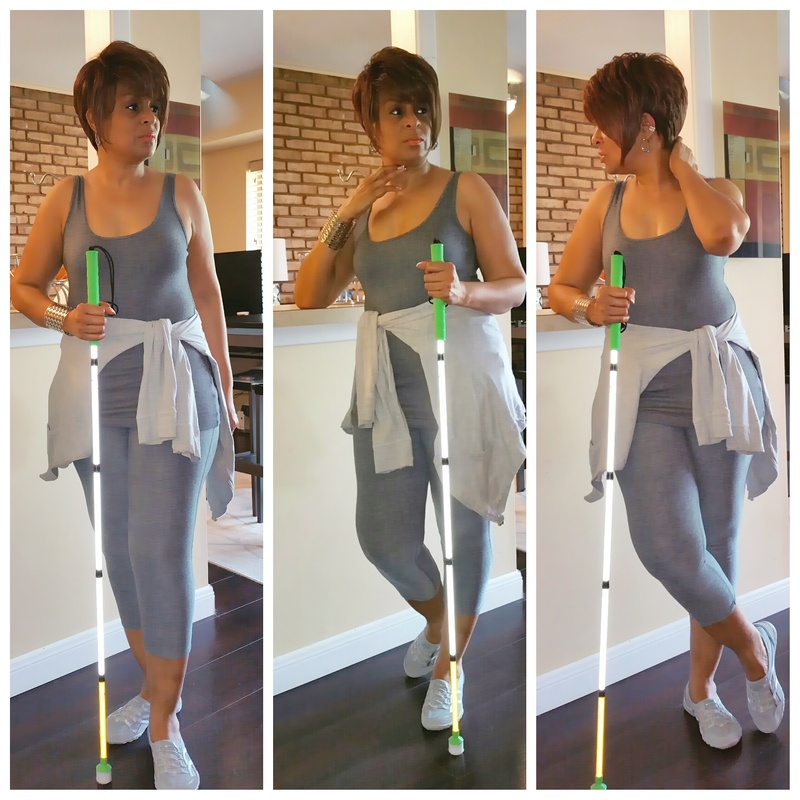 A collage of three poses of me standing with my white cane in front of my counter. I went monochrome in shades of gray: tank, capris, sneakers, and hoodies tied around my waist. My collapsible white cane folds into five sections. The section closest to the marshmallow tip is yellow, 3 sections above it are white and the handle is green.